Samsung DeX is a unique product that lets you use your phone as if it were a laptop or desktop computer. You simply connect your phone to a monitor, and optionally use a mouse, keyboard, or S-Pen to launch apps, move objects, type text, write text, or draw images. Touch Pad/Keyboard — The phone's screen appears on the connected monitor. You can use the phone's touch pad or a connected keyboard and mouse to enter text and move the cursor on the monitor. Use this mode to read or write documents, participate in video conferences, compose more complex emails, edit images, or develop slide presentations. Dual Mode — You can use both the phone screen and the monitor at the same time. Instead of having to carry both a laptop and phone, you now need only a phone. Through a single portable device, you can quickly write documents, edit spreadsheets, and create presentations on a conventional large screen. There is no need to purchase or carry along a separate laptop. The DeX mode untethers employees from their laptops, and offers enterprises many capital cost savings opportunities. Enterprises can use the Samsung Knox platform to secure the way Samsung DeX works, allowing them to benefit from the Knox Platform's defense-grade security features without sacrificing the innovation and productivity that comes with DeX. Mobile desktop experience — Enables phone use, on the go, in a desktop environment. A separate laptop is unnecessary. You can access the apps and files necessary directly using your phone. Defense-grade security on a desktop — Protects users and enterprises with industry-leading security while preserving the productivity enhancements of a desktop environment. Universal app compatibility — Compatible with the native Samsung and Android apps that are pre-installed on devices. 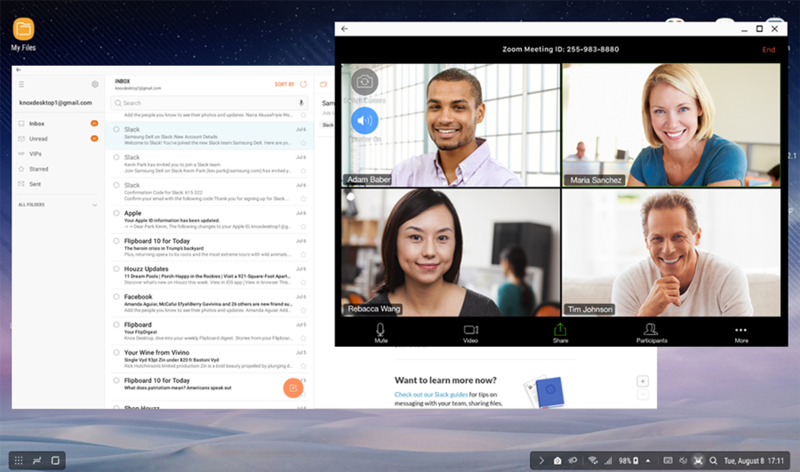 Popular apps such as Microsoft Office apps and Adobe Photoshop Express are also optimized for use with DeX to take advantage of larger, multi-app displays. Customizable — Mobile app developers can enhance and control their apps while in use with DeX, using DeX APIs from the Knox SDK.